American photojournalist John Stanmeyer has won first prize in the 2014 World Press Photo awards for his image of African migrants near Djibouti city. 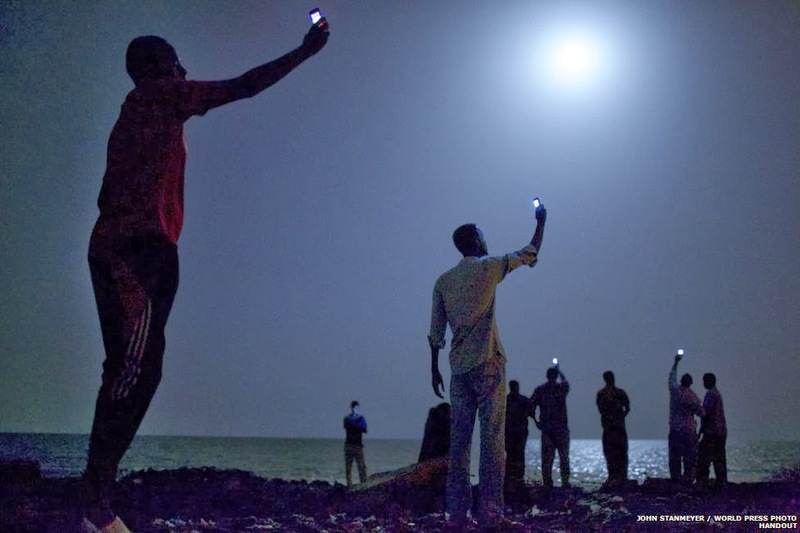 The moonlit image shows men trying to get a phone signal from nearby Somalia. Stanmeyer shot the winning image while on assignment for the US-based National Geographic, and said that it was an honor to win the prize. The prestigious awards, selected by an expert panel, have been running since 1955.
sir you must be either naive or romantic. Somalians are probably the largest drains as immigrants on the host countries. what is the relevance of this anyway besides that you liked it? How is it related to Iran's matters, where you "do not have apparently will" to provide important information about events or statements related to Iranian matters? your concerns........... about "justice" in other parts of the world. Cool down, this is about a prize-winning photo manifesting the plight of immigrants, with a technological twist. And there are an immigrant or two amongst us Iranians! "sir you must be either naive or romantic. Somalians are probably the largest drains as immigrant on the host countries." Do you want to remain insular? Or do you want to welcome humanity.